We particularly wanted our church children and representatives from our local school to take part, and so we decided to include prayer stations to give children (and adults!) a context for the Bible reading. Each station had a display, a prayer activity and a play activity. The stations could be used on other occasions, such as Bible Sunday. The library of the books of the Bible is one of the more expensive Godly Play items so we borrowed these from our diocesan resources office. Each book is colour coded according to genre – for example the letters are bright yellow and the books of prophecy pale blue. I wrote a brief description of each book of the Bible to give a context to the readings. (I based these on the Lion Handbook to the Bible, Godly Play and Lent notes by David Thomson, the Bishop of Huntingdon.) These were printed on coloured paper to match the books. We used the seven Creation cards from the Godly Play set, a snake and an apple, the Ark and the rainbow. I found it more difficult to find stories and symbols for these books. We used figures of David and Goliath, and the wooden People of God walking in a long line. Another time I would consider using the desert box and the Ark of the Covenant from the Godly Play set. We were running short of time by the time we came to set up this station, so I was only just starting to think about possibilities. I settled for the Good Shepherd to symbolise Psalm 23, but another time I would think about adding musical instruments. 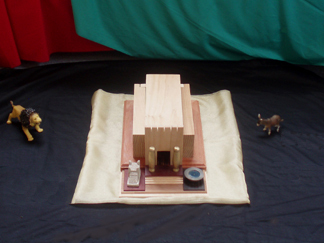 We used the Temple from the Godly Play set as the centre piece for the whole station. (This was also borrowed from the diocesan resources office.) For the books of prophecy we used a lion for Daniel, a donkey for Zechariah, a cut up plastic skeleton for Ezekiel's valley of dry bones and a whale for the book of Jonah. 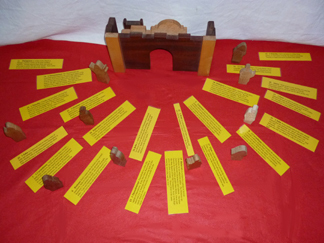 We have seven plaques showing the life of Jesus which were placed along the back. I didn't want to overload the display with Nativity figures so used just Mary, Joseph, the infant Jesus and one king. The Passion narratives were symbolised by Jesus on a donkey, wooden bread and grapes, a cross and the Easter cave with a figure of the Risen Christ. 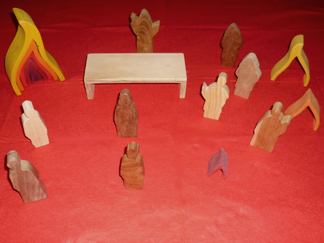 We used a red underlay, wooden flames, and wooden figures to symbolise the coming of the Holy Spirit at Pentecost. We started by just putting out the brief descriptions of each letter on a red underlay, and then as it looked quite bare we added the wooden figures. Later on in the week we decided to add the wooden model of Jerusalem with the letters radiating out. People were asked to pray that this might be true, for themselves and for others, and to light a candle to symbolise this. Choosing one of the Bible stories in the display to play with. Our church has a small undercroft area, used for storage. It seemed ideal for Paul's prison cell, even if technically most of his letters were written while under house arrest. The display at this station focused on the difficulties encountered by many Biblical writers - exile, derision, imprisonment and persecution and on the story of Saul and his experience on the Damascus Road. People were asked to give thanks for all those whom God had inspired to write the Bible and to add a stone to a cairn in memory of them. The play activity was to reach through the bars for Paul's story, and then to either read or listen to it. The monk was the main focus for this station, which also told the stories of the Gutenberg Bible, John Wycliff and William Tyndale. A selection of prayers relating to the Bible and God's word were printed out; people were invited to pray using one of the prayers on the cards. The children were invited to illuminate letters, as the monks had done. This was a very popular activity; most children looked for the letters of their name but one boy picked out the letters for "Holy Bible". Our church already had a display regarding the story of the King James Bible and its impact across the world. We asked people to copy out a favourite text and pin it on the board. Children were asked to draw their favourite Bible story and pin it up. Station 5: How far would you go to own a Bible? We based this station on the story of Mary Jones, an 18th century Welsh girl who saved for 6 years and walked 25 miles to own a Bible in her own language, inspiring Thomas Charles to form the British and Foreign Bible Society. This was a familiar story for the older children who knew it from school and we retold it in Junior Church over the summer. The children then went on to make the mountains for Mary's journey out of papier mache. 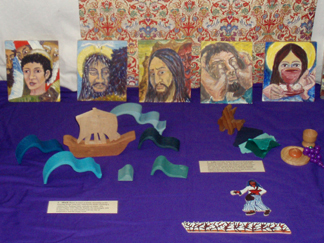 The children were asked to think about the difficulties Mary met on her journey and add objects to the model. This was a very popular activity and the children added bridges for the rivers, the figures of Mary and the minister and various animals. This station also featured the story of Brother Andrew, God's Smuggler, a Dutchman who felt called by God to smuggle Bibles into communist countries at the height of the cold war. People were asked to say a prayer for persecuted Christians across the world who were afraid to read the Bible openly and to place a flame on a country where Christians experience persecution, oppression or limitations to represent their prayer. The children were invited to investigate Brother Andrew's battered old suitcase to find out what was in it... a collection of Bibles. This was the first time I had used this particular church for Prayer Stations so it took some experimenting to find out what worked where. The figures of Paul and the monk took longer to make than I had allowed (about three days per figure) - so the putting up of the stations felt quite rushed, especially the first station for the Books of the Bible. As it was part of our Bible reading marathon, most adults preferred to sit and listen to the Bible reading but the children were very keen to get involved with the different stations. Particularly popular were illuminating a letter, drawing a favourite Bible story (which ranged from Jonah to Pentecost) and the journey of Mary Jones which really captured their imaginations. The figures of Paul in his cell and the monk were much enjoyed by both adults and children. The display of the books of the Bible and the accompanying display was a good way to give the feel of the Bible as a whole, rather than just a collection of passages. We used the stations again with the children at the all age service which marked the end of the Bible reading.